The state’s severe water shortage has certainly left no drought of ideas for how to address it—from lawmakers floating a host of water bills, to Governor Jerry Brown calling on residents to curb usage. But in Southern California, there’s no imminent threat of water rationing. In fact, the region may be in a position to help other water-starved parts of the state. The main supplier of water for 26 Southland cities—from Los Angeles to the Inland Empire—is the Metropolitan Water District. “We supply water to 19-million residents of Southern California, basically one out of every two Californians,” says MWD director Jeff Kightlinger. Since 2009, the agency has invested $3 billion in water storage and recycling projects. So even though the MWD still draws more than half its supply from outside sources like the Colorado River Aqueduct and the State Water Project, the agency has built up reserves that could last through 2016 and allow it to avoid rationing this year. At a recent news conference at MWD headquarters in L.A., Kightlinger said it’s possible the agency might actually be able give up a portion of its Colorado River water to Northern California. State officials have identified communities in ten counties that could run out of water within the next few months. The MWD did something similar in 1977, the year that was the benchmark for bad droughts in California—until now. Back then, says Kightlinger, the MWD was able to jury-rig part of the Colorado River Aqueduct to divert water to Northern California communities. And right now, there aren’t many more sources of water the MWD could share. Working collaboratively on a drought response is a message Governor Jerry Brown stressed at a meeting with water officials in L.A. last week, along with doling out some tried-and-true practical advice. Brown is also touting his administration’s five-year State Water Action Plan. It earmarks nearly $620-million for expanded storage, more efficient groundwater management, recycling and other actions. 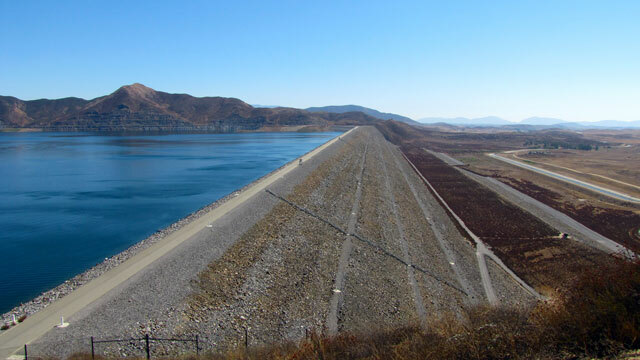 These strategies have been central to Southern California water planning for years, aimed at reducing reliance on imported water from the Colorado, the Owens Valley and other sources. Those efforts also include large-scale wastewater recycling partnerships between local water agencies and big industrial and commercial water consumers. Ron Wildermuth is head of governmental affairs at the West Basin Municipal Water District, which operates the Edward Little Water Recycling Facility in El Segundo, just south of Santa Monica. Born from the drought of the late 1980’s, the facility recycles about 40-million gallons of wastewater a day, much of which is used in oil production at refineries that ring Santa Monica Bay. “Metropolitan Water District of Southern California, they’ve spent $5 billion in the last two decades investing in storage and helping local projects like ours, so that we’re surviving this drought without restrictions right now,” said Wildermuth during a recent tour of the facility. Wildermuth says it’s great when the Governor calls on residents to flush less and take shorter showers. He says there should be even more emphasis on plans for long-term water storage and more ambitious goals for wastewater treatment and recycling. If the rainless clouds above California have a silver lining says Wildermuth, it’s that times of drought can also be used to spur lawmakers and other decision makers into pumping even more into California’s water management future. And that everyone across the state is facing a future of water scarcity, where better management and greater collaboration are critical.